One of the biggest mistakes that most Californians make when inheriting real estate from a parent is not taking advantage of California Prop 58. In fact even some Estate Planners, Attorneys and Fiduciaries do not fully understand the full benefits and how to navigate Proposition 58. California Proposition 58 provides Californians with the ability to avoid property reassessment when inheriting a home from a parent. Why is Proposition 58 and the ability to avoid property tax reassessment so important? Avoiding property reassessment means you assume the existing property tax valuation that your parent had. With how rapidly property values have appreciated in California over the last 50 years, avoiding reassessment can mean an enormous tax savings. For instance, lets say that your parents purchased their home in 1980 for $180,000. Because of California Proposition 13, the county can not reassess a home more than 2% per year while held by the same owner. For this example we will estimate the county has the home you are inheriting assessed at $250,000. If the County property tax rate is 1.2%, that means the yearly property taxes on the home are just $3,000. If you inherit the property from your parents, and you or your legal representation do not submit a request for an exclusion from reassessment and the home is currently valued at $1,250,000, your annual property taxes will jump to $15,000! That is a difference of $13,000 per year in property taxes that you could potentially be avoided. To compound the issue, property assessment values can be reassessed upwards by 2% annually. So the following year if that occurs, your property taxes will increase by another $300 as opposed to just $60 if you had received your exclusion from reassessment. Over 10 years that can really add up. How can Commercial Loan Corporation help with Proposition 58 and an exclusion from Property Tax Reassessment? California Proposition 58 has eligibility requirements. A process needs to be done correctly and proper documentation needs to be filed in order to receive and exclusion from property reassessment on a parent to child transfer of real estate. One of the stipulations is that when a parents home is held in a trust, an equal distribution of the trust assets must be made to qualify for Proposition 58. An important side note is that the beneficiary receiving the property can not use their own funds to create an equal distribution. If this is done, the assessors office views it as a property transfer between beneficiaries as opposed to a parent to child transfer, making it ineligible for a Proposition 58 exclusion from reassessment. Instead, the California Board of Equalization requires that a third party loan be used to provide the trust with sufficient cash for an equal distribution to be made. This information can be found on the California Board of Equalizations website at the following link that addresses questions and answers regarding California Proposition 58. Commercial Loan Corporation is one of the only lenders in California that provides loans to trusts with out the requirement of a personal guarantee. This unique mortgage product allows an illiquid trust to become liquid and for the inheriting beneficiary to qualify for the benefits of Proposition 58 by meeting the parent to child transfer requirement. Unlike other lenders, we specialize in Proposition 58 loans. Our trust loan enables a beneficiary to encumber the inherited home and infuse the trust with the cash needed so that an equal distribution can be made and they can qualify for the parent-child exclusion and avoid a property tax reassessment with Proposition 58. If you have any questions on the process of obtaining a loan for a property held in an irrevocable trust, please call us at 877-464-1066. One of our Proposition 58 loan specialists can answer any questions you may have. We can also provide you with a no cost trust loan benefit proposal. The proposal will show you how much you could save by optimizing your trust distribution. On average we save our clients over $6,000 per year in property taxes and $40,000 in additional distributions to beneficiaries. Let us help you avoid property tax reassessment! Call 877-464-1066 or Click Here to request additional information. Commercial Loan Corporation specializes in providing bridge loans to trusts and estates. We are one of just a handful of lenders in California that provide bridge financing to trusts. Even more importantly, we specialize in this type of lending. Often times our clients utilize our private money bridge loan financing to allow for an even distribution to be made from a trust or estate. This can be crucial when a client is trying to receive a Proposition 58 granted exclusion from property tax reassessment to preserve a parents low property tax base on inherited property. Thanks to California Proposition 13, property taxes in California can not increase by more than 2% each year. Since property values in California historically increase at a far higher rate, retaining a parents low property tax base can be incredibly valuable. In fact, on average we save our clients $6,200 a year in property taxes by helping them avoid a property tax reassessment. Over time that savings can compound, making for an incredible benefit. If you are inheriting property from a parent and are interested in preserving their low Proposition 13 property tax base, call us at 877-464-1066 and we can help you determine how much you might be able to save by utilizing one of our bridge loans. 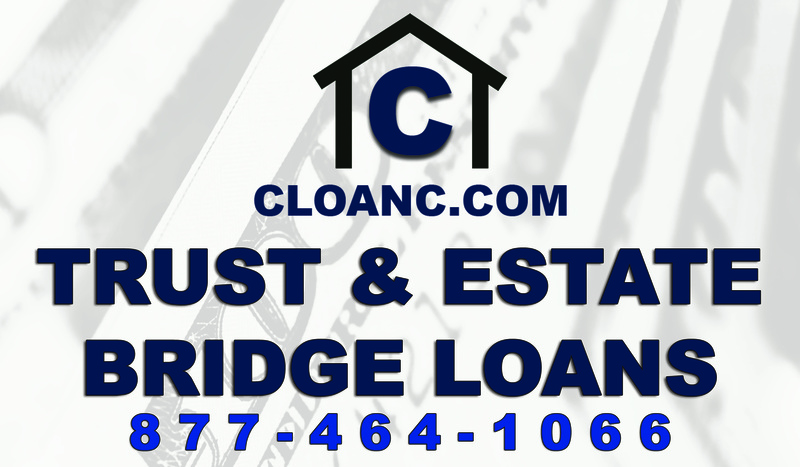 A bridge loan or bridge financing is a short term loan utilized until a person or trust secures permanent financing. Bridge loans or bridge mortgages are only intended to be held for a short period of time and typically have a term between 1 and 12 months. Many of our clients either pay our bridge loan off in full after their exclusion from property tax reassessment has been granted or will refinance the debt with a conventional mortgage once the Proposition 58 exclusion has been granted. We are also able to assist our clients with permanent financing if needed. If you, a family member or client is interest in receiving a bridge loan for a trust or estate, please call us at 877-464-1066 so that we may assist you. If your inheritance includes real estate and you want to preserve your parents or grandparents low property tax rate; there are finance options available to assist you. These loans programs often go by different names but are most commonly referred to as inheritance loans, estate loans, probate loans, or trust loans. In some cases they will also be referred to as hard money loans, private money loans or 3rd party loans for trusts. Estate, probate, inheritance and trust loans are typically more difficult to come by than conventional real estate mortgages. Often times in order to receive financing on real estate held by a trust, in probate or in an estate, you need to utilize a private money lender. These types of loans are typically intended to be used as short term financing options to provide liquidity to an estate or trust when one is trying to qualify for exclusion for reassessment of property taxes. Once the real estate has been transferred to the beneficiary or heir and the exclusion for property tax reassessment has been secured; that is when the loan is refinanced into a conventional mortgage. It does not always make sense to utilize a private money, hard money, trust loan, estate loan or probate loan; but there are situations when it does. The most common reason to do so is when dividing the assets of a trust or estate and there is not sufficient cash liquidity to achieve an equal distribution. For instance, one heir or beneficiary may wish to retain ownership of a property. If that is the case and there is not sufficient assets remaining for an equal distribution to the other parties involved; taking out a mortgage on the property may be the best option. Inheritance loans, estate loans, probate loans, and trust loans are specialized types of real estate mortgages. It can be difficult to find lenders willing to provide this type of financing. Commercial Loan Corporation specializes in this type of lending. Best of all, unlike many other private money lenders, Commercial Loan Corporation does not charge a pre-pay penalty or have a minimum interest requirement which can be costly. 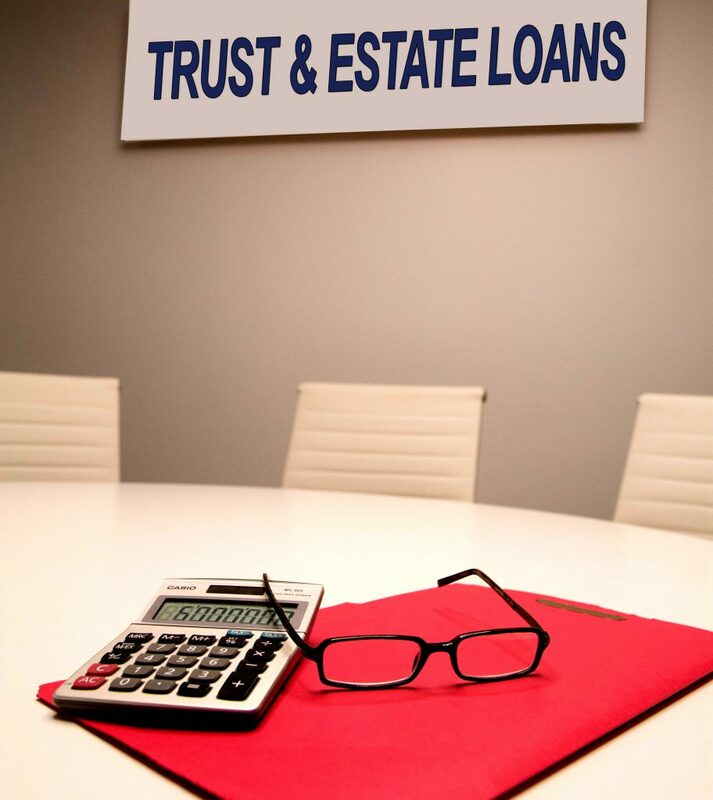 If you or your client is looking to obtain a trust loan, probate loan or estate loan, please call us at 877-464-1066 so that we may assist you. To view testimonials from some of our past clients, please view them here.